Power Electronics is critical for the efficient use of electricity and the sustainability of it’s generation. It is essentially the technology that converts electricity from one form to another. Without power electronics, we wouldn’t be able to convert electricity from solar and other renewables to a form that can be fed into the electricity grid. It allows us to create the type of electricity we need for specific purposes. If you need "Combined Heat and Power" Generation, Inoplex can help. Our Cogenerators use industry leading technology to generate heat and power when you need it. How does Power Electronics fit with Cogeneration? Power electronics allow us to decouple the power output of our Cogenerators from the engine speed. So unlike a traditional generator, we don’t have to run the engine at a specific speed to generate clean, reliable electricity. We can run our CHP Engines at any speed and still generate clean electricity with a high power factor. How our cogeneration process works? We use inverter technology to convert the electricity from our Cogenerators into the type of electricity that you need; whether it’s to run computers, industrial machinery or be fed into the grid. The first inverters create stable DC voltage, regardless of the engine speed and raw power frequency and voltage. The second set of inverters then convert this DC to grid synchronized three-phase power; or if the grid is down, provide backup power at a nominated voltage and frequency (eg 415V and 50 Hz). The inverters switch the DC at a fast enough speed to produce a clean sine wave and further filtering is included to meet the Australian standard requirements in AS4777.3:2015. This is combined with a variable speed engine that runs on a range of fuel types and quality (eg. low quality Biogas). 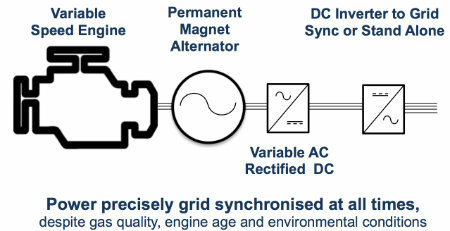 This varying speed produces raw power that our electronics converts to smooth DC power and then three phase AC power, synchronised with the grid at all times. What are the benefits of our Cogeneration technology? Being able to control the speed of our CHP Engines, means we can control how much electricity we are generating as well as how much heat at the same time. Combine this with our load following technology for both heat and power and we can set the engine speed at the optimal level for your immediate requirements. While more conventional synchronous generators can load follow to some extent, our technology allows us to turn down the electrical output from 100% to 0% with maximum efficiency. We can turn our 66 KW CHP engine down to just to run a light bulb without harming the life span of the engine. Our engine control system regulates the engine speed for maximum efficiency. Being able to generate clean power at low and variable speeds, means the Inoplex Cogenerators can generate usable electricity even if the engine is running rough. This means we can generate electricity with lower quality Biogas than many other cogenerators on the market. There can be many different devices connected to your mains power with the loads spread over the three phases. In this case, it's common to have more load on one phase than another, as different loads switch off and on during the day. The Inoplex Cogenerator will sense the different phase loadings and add more current to the phase being loaded more heavily so that the site power meter sees the phases nicely balanced. There is no need to spend extra money on phase balancing equipment. Businesses with a lot of electrical machinery can have dirty power with a high reactive power use. Reactive power is power not used for actual work but includes power used in magnetic fields etc and can typically account for around 20% of the total power. Most industrial and agricultural sites pay for this reactive power in the power costs; unlike domestic users who are generally exempt. Tracking down and replacing the individual components that are creating high levels of reactive power is time consuming and expensive, so often businesses install power factor correction equipment which can also be expensive. The Inoplex Cogenerator has been programmed to monitor the site power characteristics for reactive power and harmonics. It will then inject additional pulses of power to balance the reactive power so that the site power meter sees only the cleaned up, high quality power being used by the site. So what does this all mean for you and your business? It means that our cogeneration technology allows us to build the right cogen system for you. One that will run as efficiently as possible whilst generating the right amount of heat and power for your needs.